WriteCheck has partnered with the leading tutoring service in the education industry, Pearson Tutor Services (PTS), to help students improve their writing. Get in-depth feedback from an expert tutor on the strengths and weaknesses of your writing. Receive step-by-step guidance to make your writing even better. Get advanced help with your writing. PTS will provide a customized critique of your paper with special attention to the assignment and audience. You will receive detailed feedback in the response form, addressing areas of concern, followed by step-by-step directions for revision. 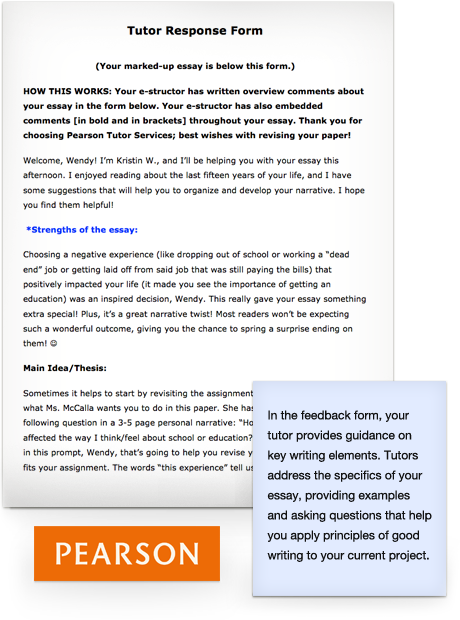 Tutors also embed 3-5 comments within the text of your paper. Go through an intensive training process in which they learn the best practices for online writing instruction. Are trained to address middle school, secondary, and post-secondary level writing. Are prepared to offer help with nearly any type of writing project: argument, narrative, and descriptive essays, research papers, creative writing pieces, career writing, and more. Have advanced degrees in composition and rhetoric, literature, creative writing, and other relevant fields within the humanities. Teach students the principles of good writing to apply to future writing projects. Which tutoring package is right for me? Submit your paper for a standard critique if it is 2,500 words (up to approximately 10 pages). The critique will address three areas of concern and provide a comprehensive overview of what you should do to make the most substantial improvements when you revise your paper. Submit your paper for an extended critique if it is up to 5,000 words (up to approximately 20 pages). This critique will also address four areas of concern and provide a comprehensive overview of what you should do to make the most substantial improvements as you revise your paper. Please use the "Instructions for Tutor" box to direct the tutor in case you wish the tutor to review specific pages of your submission.